Back in June I told you about my friend Steve Kennedy, and his plans for an around the world adventure...one that is part hiking, and part bicycling. In the month after that post Steve spent time updating his blog with stories, and photo spreads, about how he prepared with hikes and rides over the previous few weeks. In early May he spent the day riding his bike, named Renee, along the coast, from Huntington Beach to Long Beach, and back, and shares some really cool pictures of the trip, and of Renee, as well as himself. 14 days from launch, near disaster strikes on a 30 miles bike ride around Newport Beach and Irvine ( Above photo is at the Back Bay, in Newport Beach). To underscore that fact that he's a hearty adventurer, with years experience, he shares a collection beautiful photoes from a mountain climb some 34 years ago. 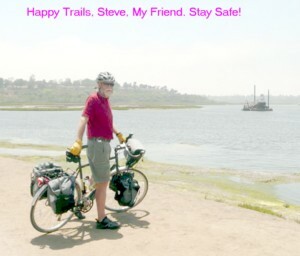 I will be checking in with Steve's blog, from time to time, to enjoy his adventure, and I hope you will, too. The Freeway Soul is out and about, and it will be an interesting journey. I didn't know you wrote this. I was traveling at the time. It's 9PM and I'm suffering from a winter cold here in Prague, -10C today, and because I can't sleep I thought I would google my Handle "pipelinepirate." This nice note you wrote came up. I'm so sorry I didn't see it before now. I'm getting closer to catching up on my blog. Also I am riding even in the cold, but it is difficult. After 1/2 hour my hands and face are frozen. Give me a couple more weeks and I will have some pictures for you.